Day zero to be precise: the day when all of those months of planning and anticipation and expectation came to an end and I became a mum. Moments after this photo was taken, on the Paignton platform of the Dartmouth Steam Railway, my waters broke. I was taken by surprise a little because Arthur actually wasn’t due for a couple more days. I remembered what we’d been told in our antenatal classes, and fully expected that this might not imminently signal the start of labour – we’d been told only to get concerned if things hadn’t started progressing within 48 hours. But half an hour later, just after I’d sat down with my family for lunch, I experienced my first contraction. It was beginning. You can read the rest of my birth story here. But what’s most significant about this picture, about the person I was and the thoughts I had on that last day out before Arthur was born, is how much everything changed once he was here. I thought I knew what to expect. I thought I knew how I would want to do things, what sort of mum I wanted to be, what I would be capable of. But I know now that I really had no idea. It’s been such an incredibly steep learning curve over the past twenty-two months, and my primary teacher has been my son. I love that for all my love of planning, my tendency to want to be in control of everything all of the time, to want to know what’s coming and anticipate how I’m going to react to it, I’ve actually been able to let go so much. I can’t say it’s true of other aspects of my life, but I love that where parenting Arthur is concerned I’ve generally managed to let him take the lead in our adventure. And as his second birthday fast approaches, and that bump which transformed into a baby and then a toddler is fast transforming into a little boy, I know that for all that has happened over the past two years, our adventure is still just beginning. 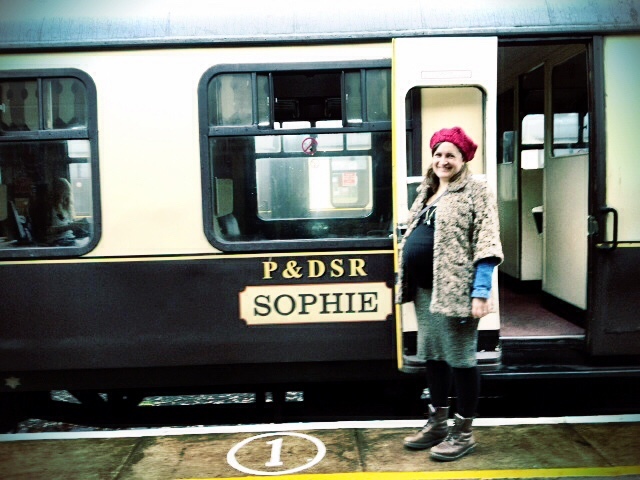 This entry was posted in Sophie is parenting, Sophie is photographing, Uncategorized and tagged birth, Dartmouth Steam Railway, labour, motherhood, Paignton on November 5, 2014 by sophieblovett. Love the photo! You look so happy 🙂 #alphabetphoto. Such a brilliant photo made even better by its context! What a fab choice and a great memory. I don’t think anything or anyone can prepare you for having children but it is great fun learning isn’t it!